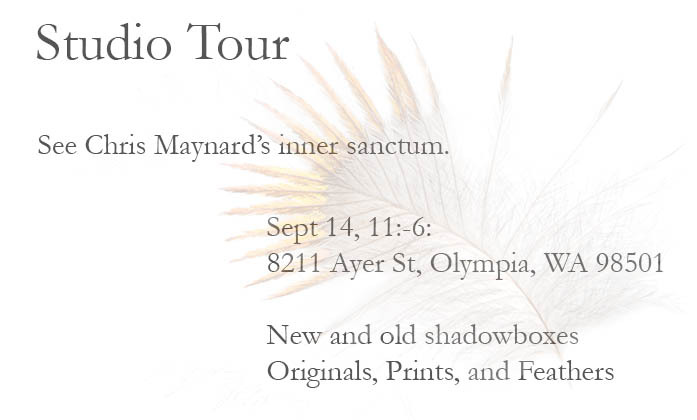 I am excited to offer my studio for an end of the summer art tour. The day should be perfect, sunny and warm but not too hot. New pieces wait your viewing including a 6 foot long crow theme piece, still unframed. You can purchase original art andsmall and larger prints and cards. The feathers I work with will show their stuff, different kinds that you have probably never seen. See where it is that I cut and arrange feathers into shadowbox designs. The drive is well marked with half circle window facing the main road, Ayer Street, and a green-roofed barn in back. Bear right on the gravel drive and you will be directed by signs to parking. The salmon are running so fish are getting smoked and will be on hand to munch on along with wine, juice, and cheese.